Rab Alpha Freak Pull-On. Inspired by the world's best alpine climbers the Alpha Freak Pull-On is a unique and innovative body mapped midlayer specifically designed for moving fast in harsh conditions over many days. Designed using a combination of innovative fabrics, Polartec Alpha Direct 200 Insulation keeps your core warm, quickly wicking moisture, while Polartec Power Grid fabric on the waist, sides, underarm and cuff allow a full range of movement as well as easy layering with a harness, reducing bulk. The under helmet hood is made with Pertex Quantum outer and Polartec Power Grid which blocks the wind, keeps out spin drift, and dries quickly, preventing the hood from freezing. 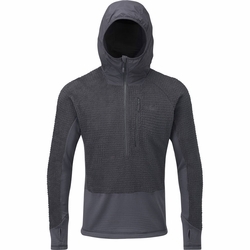 Designed with a streamlined slim fit, other features include a half length front zip to quickly dump heat, storm flap, chin guard, and one zipped chest pocket. Seemingly simple, this light but effective pull-on is the ultimate alpine midlayer, continuing Rab's tradition of innovation inspired by decades of experience in the mountains.